This Rumble ended on 2001-12-31 00:00:00.0. Achilles Heel: Lust for killing kender. Icon Status: Has become an icon of how NOT to try to kill a kender. Why he'll win: A bad attitude, superior intellect, and no qualms with playing dirty. Looks: Quasimodo lost battle to the "Ugly Stick". Currently Spends Free Time: Sitting in Flotsam, gloating over the fact that he's still alive. Achilles Heel: Must replace batteries every 3,000 miles. Icon Status: Has become a cultural icon, serving as a symbol of longevity, perseverance and determination. Looks: Blues Brothers meets carnival toy. Currently Spends Free Time: Working part time in Infomercials for removing unwanted back hair. Likes: A long straight open road. "Nothing will be left but the residual pink fur after I strip that rabbit clean and make stew of him." This statement made by the infamous Lord Teode two days prior to the engagement. Lord Teode publicist and trusted ally Groag Hobgoblin delivered the statement to the press shortly after Lord Teode's humiliating defeat at the hands of Mumra-the-Ever-Living. 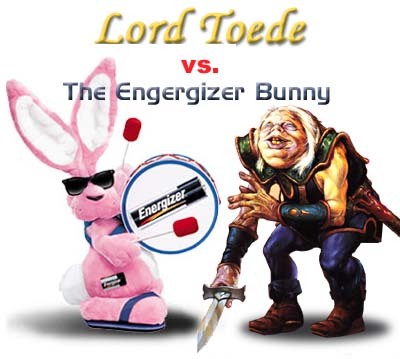 "Lord Teode claimed that any member of the rabbit species who would support such an obvious embarrassment to it's species, such as the "Energizer Bunny", should have slit it's own wrists long ago." The Energizer company spokesman had this to say "A pink bunny playing a drum and wearing shades and blue sandals has got to be cool. America's favorite hare first found fame beating his drum across our popular television parody commercials. As his first engagement versus "Berem the Everman" proved, he's unstoppable—the battery powering him has so much power that he keeps going and going. His popularity far out-weighs that of The Toad and he will be putting the smack-down on him in no time flat." An enraged Lord Teode had this to say, "I've been killed a thousands times over and this furball thinks he can get the better of me? I've been boiled alive, stabbed, eaten, and dropped from a height of 30,000 feet onto my head. What could he possible do that would be any worse? Bang me with his drumsticks?" When asked about his loss to Mumra, Lord Toede began to sputter and turn a dark shade of purple before yelling "That was totally unfair! Do you really think the eruption of a thousand scarab beetles under my feet was an accident as he claimed?!!" All further statements regarding the match have been suppressed under the advice of Teode's publicist. The Energizer Bunny himself was only available for comments in between takes for his latest commercial where he will be running across the desk of a "Miss Cleo" Psychic Hotline Commercial. "Whatever. This Toad guy is so full of it. I've been doing this for twelve years now. The bunny suit may look kind of dorky, but you know what? The chicks dig it and I'm making good money so I can't complain. Before the match I'll be upgrading to the Energizer(e2) Titanium edition, so there won't be any stopping me. He'll be squashed like frogger for sure." Fans of both camps are eagerly awaiting the competition and the outcome of the battle.